From its earliest days, the Jeep nameplate was more than just another vehicle. Jeep vehicles carried soldiers into combat, protected servicemen and women in war zones and helped foster a strong sense of national pride. At the same time, the Jeep name was also making waves on the most rugged trails the world had to offer. In fact, the sport of off-roading is almost synonymous with the iconic Jeep nameplate, and many a Jeep owner has left the highway behind to enjoy an off-road adventure on the weekends. These Jeep vehicles may be rugged, but they are not bulletproof. Your Jeep still needs the right maintenance to stay running right, and it is important to find a quality service center, one that understands the needs of your vehicle and how to service it. If you are a resident of Fairfax and the surrounding area, you do not have to look any further for the service and repairs your Jeep vehicle needs. 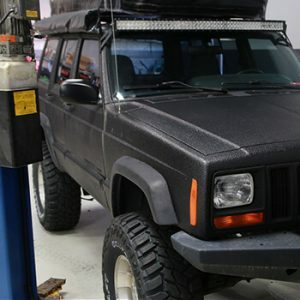 At Fairfax Auto Repair, we understand the iconic Jeep, and we will do what it takes to make the repairs you need. If you want your Jeep to last and provide many more years of quality service, you need to take good care of your set of wheels. Preventative maintenance is the key to a long-lasting Jeep vehicle, and at Fairfax Auto Repair, we can design a maintenance schedule that works for you and the vehicle you drive. From routine oil changes and fluid top-offs to changing the belts and hoses, Fairfax Auto Repair can design a customized preventative maintenance schedule, one that can extend the life of your engine, help your transmission last longer and minimize your overall cost of ownership. At Fairfax Auto Repair, we know that preventative maintenance is key to a long vehicle life, and we will work with you to design that schedule and help you stick to it. The Jeep is not as simple as it looks – even the basic Jeep models are filled with sophisticated systems and a complex series of sensors, all designed to give you an early warning should something go wrong. If your check engine light is on or your Jeep is not running right, it is time for a quality diagnosis, and that is where Fairfax Auto Repair comes in. We use our state of the art diagnostic equipment to pinpoint the problem and find the problem fast, so we can get started on the repairs you need. We know that taking your Jeep in for service can be scary, but at Fairfax Auto Repair, we aim to make the process as easy and painless as possible. That starts with a quality diagnosis, and it does not end until you are satisfied. The next time your Jeep needs service, just give Fairfax Auto Repair a call. We are your Jeep experts in the Fairfax area, and you can rely on us for the service and repairs you need.